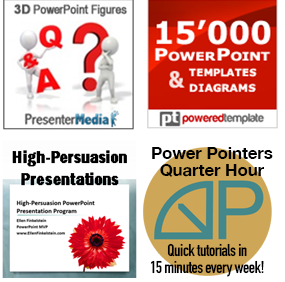 A presentation that communicates well uses a slide to help the audience understand and remember your point. If you use the Tell ‘n’ ShowSM Method, you can do this easily. Don’t you think that will get their attention? It’ll probably get a laugh, too. This delivery technique requires you to ungroup the graph and animate its pieces to appear as you explain. 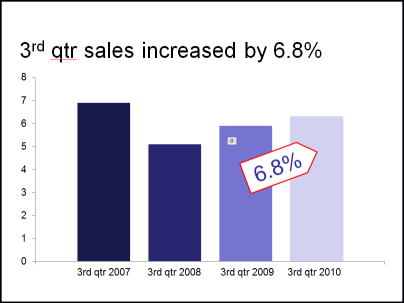 Finally, you’ll reveal the secret, the increase in 3rd quarter sales. Here’s a video that shows how you could explain this slide. By keeping the number unknown until near the end of the explanation, you ensure that people will listen! To bring in a chart piece by piece, you can use PowerPoint’s standard animation, but it may not give you the options you want. Instead, you can ungroup the chart and manually add the animation you need. This is a bit of a chore and you lose the connection between the chart and the data (if any). 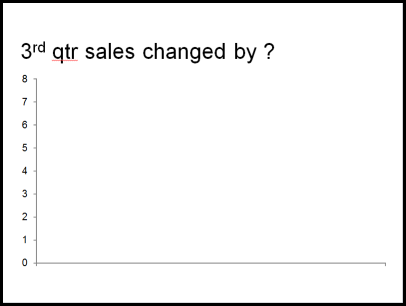 In PowerPoint 2007 and 2010, you can’t actually ungroup a chart, so you need to use a workaround. For more information, see the tip below. Your point about animating slides to build is particularly relevant. In fact, all graphs should be animated so that they appear in stages – it helps the audience to assimilate information, and to focus on what is most important at the relevant time! Even if I’m not a fan for slides I liked your point. Hi and congrats for your videos!